One of our most powerful meditation resources this Lent is Meeting Jesus on the Margins: Meditations on Matthew 25. These reflections look at Jesus’ mission with the hungry, the sick, the imprisoned—the marginalized. Today, Ash Wednesday, we’re posting the first reflection from the volume, written by Mike Kinman. It’s part of a first section that focuses on the matter of hunger in its myriad forms. We hope you find meaning in Mike’s words, and share them as you see fit. The simplest question is the most useful: Why? We need always to be asking “Why?” and not letting our quickest answers, which are most deeply rooted in our prejudices, be our final answer. Our first answer, rooted in what we’ve always been taught, might be that we observe Lent as an exercise in self-flagellation, so that, in Paul’s words, we might not “think of ourself more highly than we ought” (Romans 12:3). We might think our Lenten observance is grounded in our unworthiness. But we need to dig deeper. The prayer at the beginning of our Ash Wednesday liturgy gives us the answer. We observe a holy Lent to remember Jesus’ gospel of “pardon and absolution.” Lent is not about confession and repentance as punishment but as a profound, grace-filled unburdening so that we might encounter the living Christ in all Christ’s abundant joy. 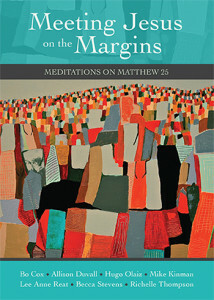 Click here to get a copy of Meeting Jesus on the Margins, or to download the book to your e-reader.